The demolition of the Ethan Allen Carriage House building on North Third Street has shed unexpected light on some forgotten Paducah history. 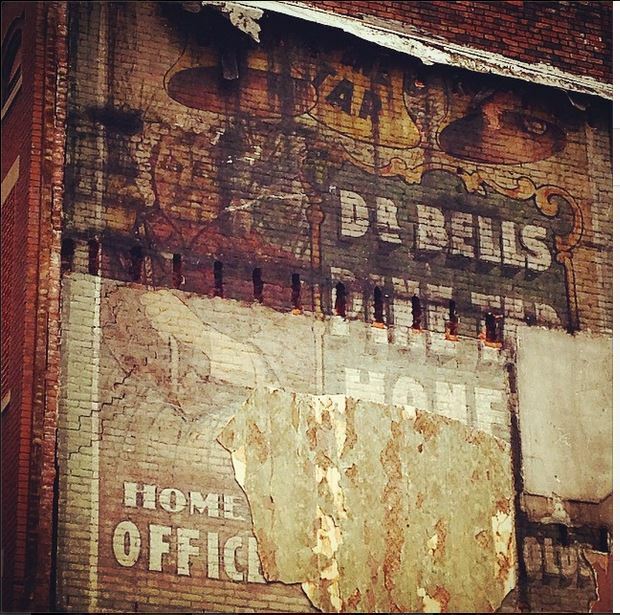 As the layers of brick and mortar have been removed, a painting has revealed itself, an advertisement which spans the outside wall of the building and features a string of bells and an old woman in a white cap. It turns out that in the early 1900’s the building at 126 N. 3rd was home to E. E. Sutherland Medicine Company famed for their elixir, Dr. Bell’s Pine Tar Honey. The painting revealed on the building begs several questions. 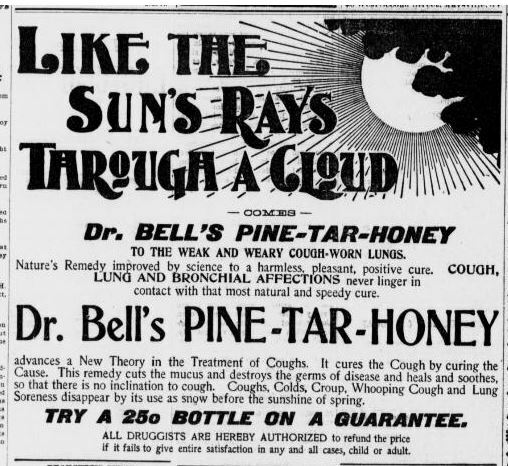 What was Dr. Bell’s Pine Tar Honey? Who was E. E. Sutherland? Who is the old woman? And just who was Dr. Bell? Who was E. E. Sutherland? The earliest reference we can find to Eli E. Sutherland setting up shop in Paducah is from an 1890 Paducah City Directory. The listing reads, “Sutherland, Eli E., Druggist and Pharmacist. Dealer in Drugs, Medicines, Chemicals, Toilet Goods, &c. 224 Broadway. Residence same.” We don’t know when exactly Sutherland first began production of Dr. Bell’s elixir or where he acquired the recipe, but we do know from a Paducah Daily Sun article in 1897 that Sutherland and the purported medicine had reached a familiarity and popularity beyond Western Kentucky. Said the Daily Sun, “One evidence of Paducah’s prosperity, industry and enterprise was the departure of a large carload of Dr. Bell’s remedies today, shipped to St. Louis for the retailers there.” The distribution of the elixir and the good name of Mr. Sutherland grew to the point that in 1902 Eli Sutherland left Paducah to work for E.C. Dewitt and Co., a large and prosperous medicine manufacturer in Chicago. Despite Sutherland’s departure, Dr. Bell’s Pine Tar Honey continued to bear his moniker. In leaving Paducah, he sold not only the recipe to the elixir, but also his own name. In 1903, the E. E. Sutherland Medicine Company, now under the management of a Mr. R. Rudy, continued its manufacture of Dr. Bell’s Pine Tar Honey out of their new, larger building. And you guessed it, that’s the building at 126 North Third. Under Mr. Rudy’s direction the popularity of Dr. Bell’s Pine Tar Honey continued expanding. By 1908, Dr. Bell’s was distributed and advertised in every state in the Union, as well as Mexico. By 1911, an article in the Crittenden Record Press claimed that the E. E. Sutherland Medicine Company had outgrown its Third Street location and was looking to build a new plant at the intersection of Jefferson and the Illinois Central railroad lines, such that the plant could have its own private tracks. Who is the old woman? Perhaps some of the popularity of Dr. Bell’s Pine Tar Honey can be attributed to its effectiveness. And that’s a pretty vague attribution. More of its popularity is probably due to its advertising, particularly the face and name given its product. No, not of Mr. R. Rudy, and not of Mr. E. E. Sutherland, but of an old woman in the white cap who was not only featured on the side of the Third Street building but in almost every ad for Dr. Bell’s that ran around the country. Her face, just like the one in the painting on the building, was pictured in numerous ads often with a testimonial that said something like, “I am 87 years old, and have used about all of the cough and lung remedies that have been sold during my life: and for the benefit of suffering I will say that I have never used any remedy equal to Dr. Bell’s Pine Tar Honey.” The old woman in the ad was named “Granny Metcalfe,” and she was, in fact, a real person. Malvina Adeline Metcalfe was born in 1809 in Caseyville, KY. She married a Col. James Metcalfe who died during the Civil War and gave birth to ten children, though she outlived six of them. So, how exactly did she become associated with a nationally advertised product, her kind, trustworthy grandmotherly face plastered in hundreds of papers throughout the early 20th century? Truth is, we don’t know for sure. But it just so happens that at the age of 83 she moved to Paducah to be closer to a couple of her sons, Thomas and Frank, both of whom happened to work for the E. E. Sutherland Medicine Company. Despite dying in 1898, Granny Metcalfe’s name and testimonials continued to appear in newspapers well into the 1900’s. So that leaves us with one question, which also happens to be the hardest to answer. This medicinal product was first bottled by Eli Sutherland, then Mr. R. Rudy, and featured Granny Malvina Metcalfe’s face, yet all this time it was marketed as Dr. Bell’s Pine Tar Honey. So who was Dr. Bell? The honest answer is, we don’t know. But, as always, we in Local and Family History don’t like to leave a stone unturned, so we do have a guess. As we said before Eli Sutherland’s name first appears in Paducah in the 1890 City Directory. In the same directory another pharmacist is listed with a store at 1383 Broadway…a Dr. W. A. Bell. By 1890, Dr. Bell had already been a long time resident of Paducah. His name first appeared as a druggist in Paducah in the 1860 McCracken County Census, making Dr. Bell a trusted name in the city for 30 years before E. E. Sutherland arrived on the scene. For a brief period though, perhaps a couple of years, Bell and Sutherland were druggists at the same time. Coincidentally, however, about the time that Dr. Bell’s Pine Tar Honey begins to become popular, Dr. W.A. Bell disappears from the Paducah directories, presumably because of death. We’re not claiming that the two Doctors Bell—the druggist and one of Pine Tar Honey fame– are the same person, but it is awfully curious. So, there you have it….a bit of Paducah history (as best we can make of it,) hidden behind a wall of bricks and finally revealed by demolition. The painting has been gone from sight for nearly a century, but is readying to be gone for good. Make sure to wander down to Third Street and see it with your own eyes before it does. Many thanks to J.D. Wilkes, musician and historian, for the great photo of the exposed painting. And for more information about snake oil and hidden history, visit us at the Local and Family History Department at the McCracken County Public Library. WHAT’S HIDING IN THE 37 FLOOD MONUMENT?